SeekersHub — formerly SeekersGuidance, then SeekersHub Global — is a not-for-profit organization that provides online and on-ground Islamic education at no cost to its students. To date, over 30,000 students from 130 countries have enrolled in SeekersHub's courses, and their "Answers" service has provided close to 3,000 responses to questions submitted online. They host biannual week-long retreats in various cities worldwide, have several "satellite" locations where pre-recorded classes are telecast to a live audience, and have an active online presence through their blog, podcasts, and social media channels. All of this is with the purpose of disseminating authentic Islamic knowledge, grounded in a normative understanding of the religion — a task which has become increasingly critical in an age of misinformation propagated by extremists. SeekersGuidance is based out of Toronto, Ontario, Canada and following their merger with Sydney, Australia based Al-Ghazzali Centre, requested a rebrand. The new identity, along with a revised name — SeekersHub — would mark the beginning of a new period for the two organizations. We conducted research into the organization's student base and created personas to represent the target audience. This gave us a point of reference to ensure decisions were made with the end user's brand experience in mind. Concurrently, a discussion around naming conventions was undertaken, and the brand family was trimmed down to a core set of extensions. Many options were explored for the identity design — looking at everything from compass stylization, typeface selections, and color combinations. 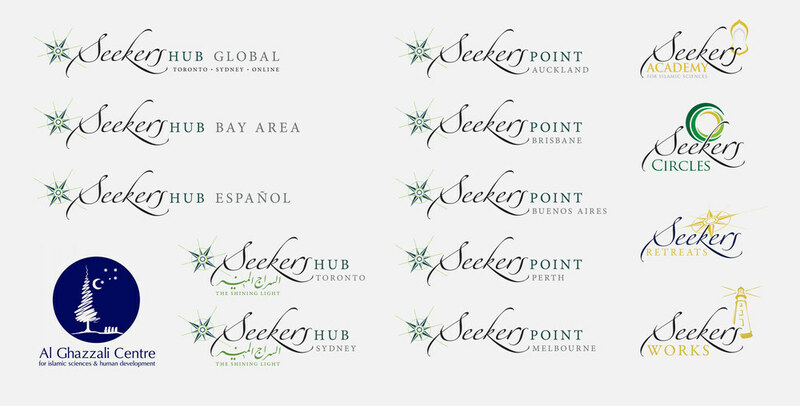 A select few options were presented to the SeekersHub management, which were further narrowed down and refined into the final identity. Previous identities. Readability and legibility were compromised when the logos were reduced in size. The compass' spokes also became hard to distinguish. The icon + wordmark (and in some cases, + tagline) lockup made for odd negative spaces. An exploration of compass styles. New identity and brand extensions. The challenges presented by the previous identity were resolved. Brand equity was carried over through a refined compass and color palette that was still reminiscent of the previous identity. Alternative lockups for layouts better suited to a left-aligned logo. [above] Guidelines on minimum buffer space. [below] Color and single-color applications. [below] Web banners for classes.